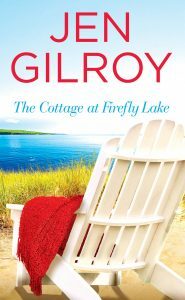 As some of you know, my first book, The Cottage at Firefly Lake, has been shortlisted for The Romantic Novelists’ Association (RNA) Joan Hessayon Award for 2017. All the nominees (see the full list here and discover their wonderful books) will gather for the award presentation at the RNA Summer party in London, England on 18 May. Although I’d planned to attend and share London with you in person, I’ve unfortunately had to cancel my trip. However, since I still wanted to mark this award nomination on my blog, next best is visiting London virtually with the help of blogger and former BBC journalist Catherine Boardman. 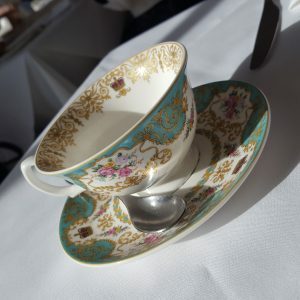 Now that I live in small-town Canada, Catherine’s “Cultural Wednesdays” posts give me my weekly fix of British culture and are a window on a world I miss. I first fell in love with London as a student. When I stepped out of the airport on that long-ago September night, the rain falling in sheets onto dark-slicked streets where red double-decker buses jostled with black cabs against a jumble of buildings old and new, the city cast a spell on me that has never waned. I was lucky to live in London for almost five years. I lived just outside London for almost fourteen more. In that time, I got to know a city made up of a patchwork quilt of individual neighbourhoods. I visited world-class museums and galleries, ancient churches, quirky pubs, and out-of-the-way parks and gardens in streets almost untouched by modern life. I experienced the old London as well as the new, and living amidst all that history changed who I am and how I see the world. The London highlights that Catherine has shared with us (click on each heading to read her post) are perfect for spring and touch on some of my personal favourites: bookshops, gardens and royal heritage. There is also cake, a staple of both my life and the traditional English afternoon tea. While several of these shops are as familiar as old friends, Catherine has introduced me to some new ones as well. 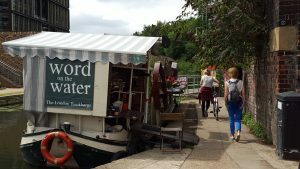 Second-hand books on a barge? Count me in! With a book (or more!) in hand, what better place to read than a garden in springtime? 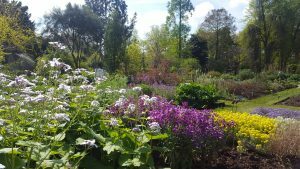 A peaceful haven, the Chelsea Physic Garden is a feast for the senses and serves a practical function too as all its plants are either edible or used for medicinal purposes. Monarchist or not, sampling some of London’s royal heritage is a must. 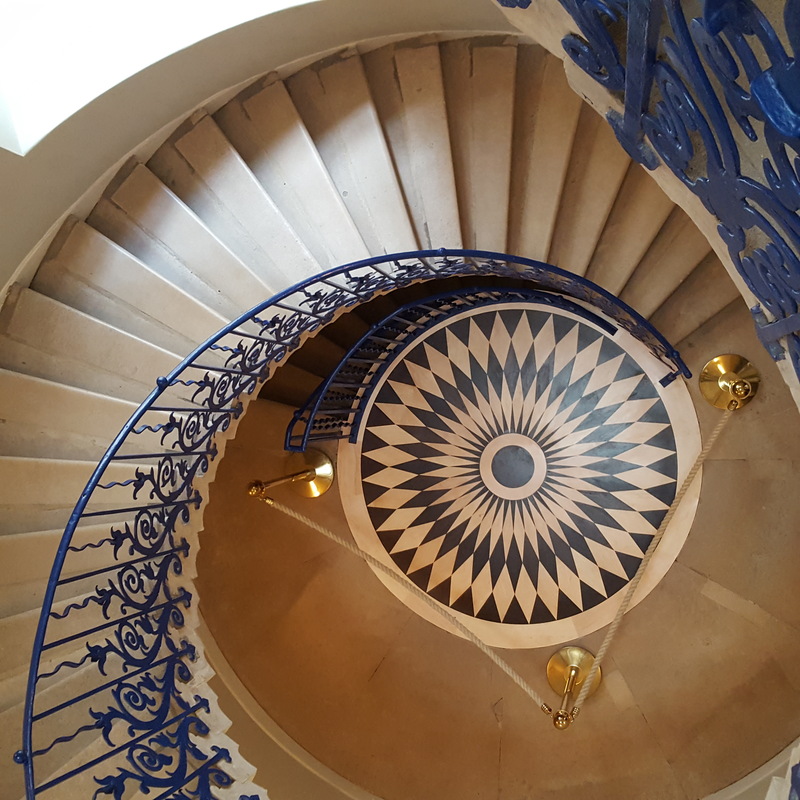 Queen’s House in Greenwich is new to me, and this stunning Tulip Staircase is reason alone for a visit. Best of all, in an often-expensive city, entry is free. No visit to London is complete without a stop in a café. It’s essential fuel for all that sightseeing, and Catherine and I share a fondness for snapping pictures of desserts, hot beverages and china. The Orangery at Kensington Palace is one of my favourite spots for a special lunch and, as an added bonus, there’s the royal connection too. For visitors and residents alike, London is a city with surprises around every corner. Although I’ll miss travelling there this month to mark a special milestone in my writing life and meeting up with author friends old and new, I’m grateful to Catherine for popping along to my blog to share bits of her London with us. Do you have a favourite London place to add to Catherine’s list? And if you’d like your own weekly fix of British culture (and possibly cake), follow Catherine’s blog here. You can also connect with her on Facebook, Instagram, Pinterest and Twitter. Thanks so much for sharing your “London” memories, Jen. It’s so special to recall time spent living in different places! I’ve always believed that experiencing new living situations can open our eyes to other cultures, and the richness of their traditions. It is, Heidi, and I know that you have memories of time spent living in different places of your own so can relate. Thanks for commenting and sharing your thoughts. What a shame you aren’t able to come to London to mark The Cottage at Firefly Lake’s nomination, Jen, but a lovely idea to have a virtual trip courtesy of Catherine. Her Cultural Wednesdays blog is a real treasure chest of ideas for getting out and about. She excels at finding exactly the right photograph to capture the essence of a place. I enjoyed reading about your experiences of living in London. I hope Catherine’s blog-links and photos have brought back happy memories. Thanks for your good wishes, Lynn. As always, I appreciate your support of my blog. I’m glad this post sparked memories of London for you. Good Luck with Cottage at Firefly Lake for the Joan Hessayon award! You have worked so hard and I’m so pleased that you have come so far. It’s also good to see all of the other nominees who have come through the RNA NWS scheme. I hope one day to take part myself!! Thanks for your good wishes, Jean. I appreciate you being a part of my writing journey. I too hope that I’m celebrating you as an RNA NWS ‘graduate’ one day! PS Sorry you can’t make it to London for the party. Will they have a video of you like famous actors when they can’t attend the Oscars if you win??!!! I’m disappointed not to be able to attend the party, too. No video of the event, but I shall be following along via RNA Tweets on the day.